Exercise is one of the most beneficial things that you can do to stimulate and strengthen your brain. For college students, these benefits can carry over to the classroom, but the number of college students that hit the gym is low. Some people might find that sitting in lecture halls for hours on end doesn’t quite engage them, but if they are made to do something more hands on and interactive, it engages their minds more easily. This kind of kinesthetic learning is related to the way in which our brains evolved, with humans constantly moving and exercising. In the book “Brain Rules,” John Medina recounts the work researchers did on sedentary people, measuring how exercise affected their cognitive performance. However with the time demands of college and for some students who also have jobs how do students fit in the time to get to the gym? Some students feel like college is stressful, and cite this as a reason for not having time for the gym. But according to the American Psychological Association, exercise is one of the best ways to cope with stress. The great thing about college is that it is one of your last opportunities in life to take classes that allow you to workout, but that also give you set times and days of when you are supposed to go. Students may still be paying for these classes, but they will have to pay for a gym membership anyway. But the difference between fitness classes and going to the gym is that when students go to the classes they will have a set schedule waiting for them, and a professor who wants to teach students how to be fit and healthy every time they go in. They will also have fellow classmates that they see doing the work with them, motivating them to work harder. Although it would be nice to have a gym membership, partner or personal trainer, having a similar setting in a regularly scheduled class is a great way to get the brain benefits of exercise, and do better in other classes. 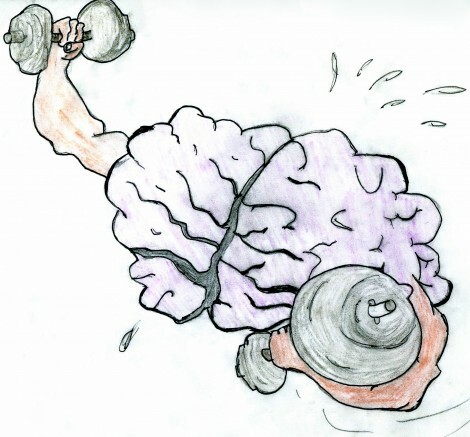 Be the first to comment on "Opinion: Strengthening your body strengthens your brain"